Another quick update, one of my girlfriends is getting hitched, and this weekend we celebrated her bachelorette. My girl loves to dance, so we headed to Guvernment for their glow paint party. Her one requirement for her ladies - wear neon! So I headed out Friday afternoon to pick out the perfect outfit to dance the night away in. I've been dying to try out the peekaboo crop top trend, and I figured what better place than a neon dance party? 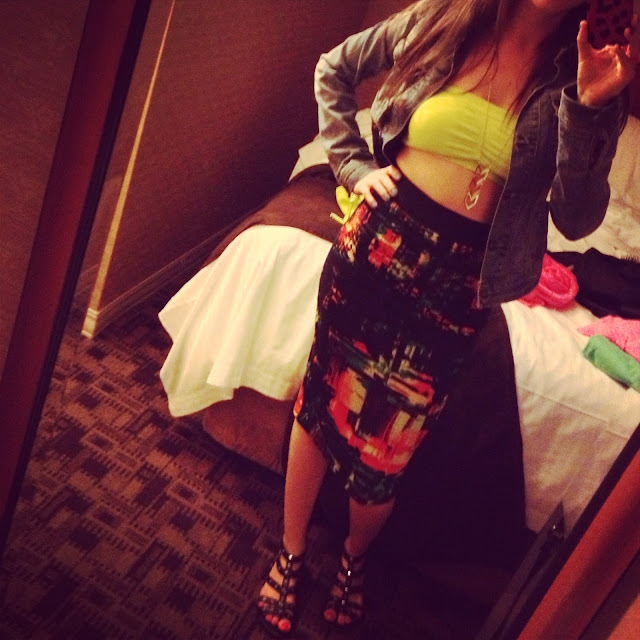 I found this adorable high waist skirt and neon bandeau top at the new Urban Behaviour on Queen West for a whopping $13, throw on a denim jacket to keep it classy and I thought it all came together amazing! You can't tell in the pictures, but one of the bridesmaids is also a makeup artist, and she gave me wicked neon pink eye makeup to complete the look. I loved it all! Needless to say we had a blast and I'm still in recovery. What are your thoughts on the peekaboo crop top trend? Is it a do or a don't?